First, a quick public service announcement: I got a temporary full time job over the summer doing mental health counseling at my old internship site, and so I’ve closed my art commissions list for the time being. You can read more at the link, but in short, I’m really excited about the job. It’s been wonderful working more in service with the non-human end of my community, but this will reconnect me with serving my human community (in more capacity than making artwork and writing things for them). Actually, let’s make it a pair of PSAs, since I wrote earlier this month about ethics and consuming animals: here’s a Kickstarter for those who want to support a more ethical approach to omnivorism. Now, on to the main event! 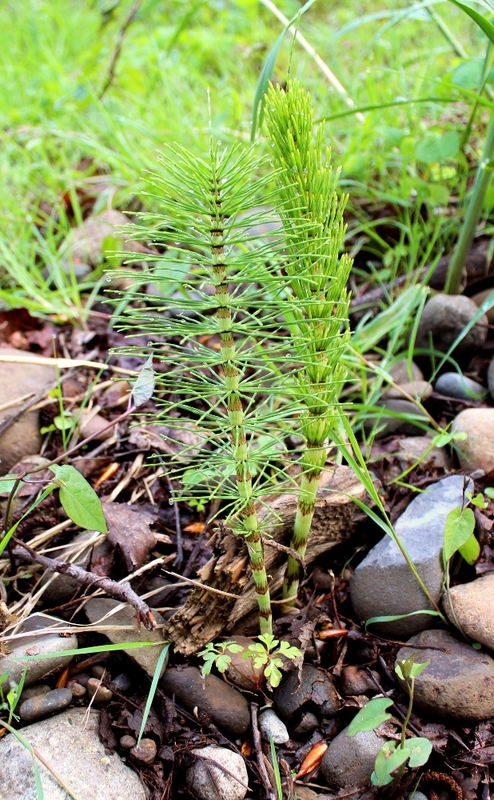 Newly rejuvenated giant horsetails at Bridal Veil. Lupa, 2013. So earlier this week my friend Emily and I escaped to the desert of Eastern Oregon to explore the John Day Fossil Beds. Neither of us had been there, and since my upcoming job will be keeping me in town during the week, I’m trying to get as much further-away travel done before it starts next month. We decided an overnight trip would be enough for this first excursion, and so she dragged me out of my apartment bright and early on Monday morning. It would be impossible to describe to you every wonderful moment of this trip. We started our journey with a stopover at the Bridal Veil post office to give this ghost town survivor some much-needed business, and to stretch our photography muscles for the trip. Our journey through the Columbia River Gorge and then south into the desert was puncuated by windmills, abandoned houses, and many stops to marvel at vistas and break out the cameras. We managed to achieve the trifecta–we visited the Painted Hills, Clarno, and Sheep Rock units, and were able to explore each in some detail. We went to the Cant Ranch with its century-old house and rusted-out tractors, and we stayed the night in Dayville, Oregon in a little cabin guarded by two of the least threatening Golden Retrievers ever. We hiked in the Blue Basin surrounded by towers of azure-tinted tuff, and Emily watched as I scrambled down a river slope to investigate an elk skull a hunter had left behind. We thoroughly investigated the paleontology center, and each came out with a postcard adorned with fossil skulls. We came home on the 84 accompanied by a lengthy sunset in the Gorge and a half-moon surrounded by stars. In short, it was just about as perfect a trip as we could have hoped for. People speak about the desert being lifeless. Those of us who have been there and who pay attention know better; it thrives, in clear and radiant defiance of the threat of scant water and harsh weather. 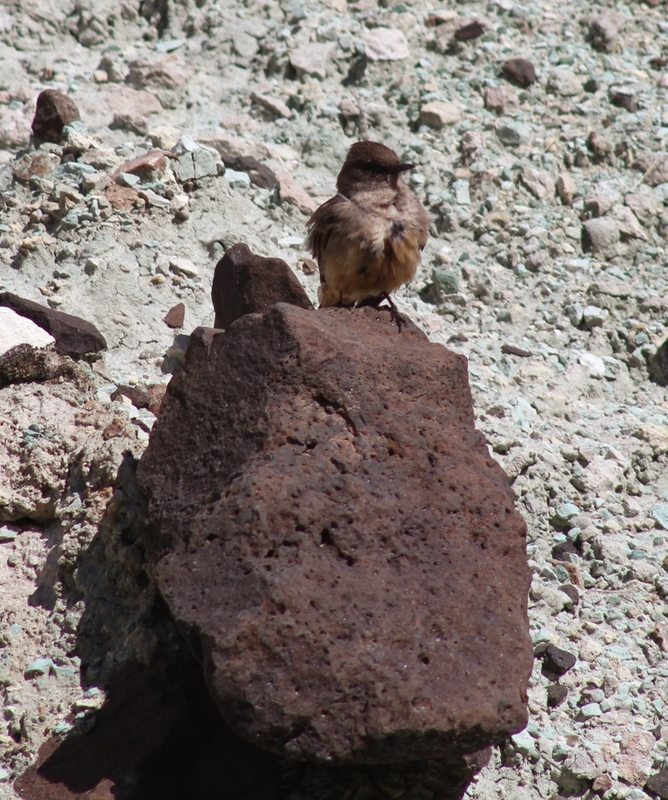 We saw our first black-billed magpies and I snapped a picture of a Say’s phoebe. There were ravens and vultures and ospreys galore, robins and juncos and even a wayward Canada goose. I saw what might have been a pronghorn walking through the sagebrush in a dry creek bed. And the “alert” put into effect by the park–that we must be notified of the presence of wildflowers–served to introduce us to the local flora. Purple silky lupine and bright yellow balsamroot vied for attention among rabbitbrush and juniper berries, and as the days warmed up the piquant scent of the sage filled the air. Even a few hardy lichens flattened themselves against the rocks like dried crusts of paint daubed by an itinerant artist cleaning her brushes after completing the masterpiece of the Hills. Sheep Rock, Oregon. Lupa, 2013. And, of course, there’s the human life. 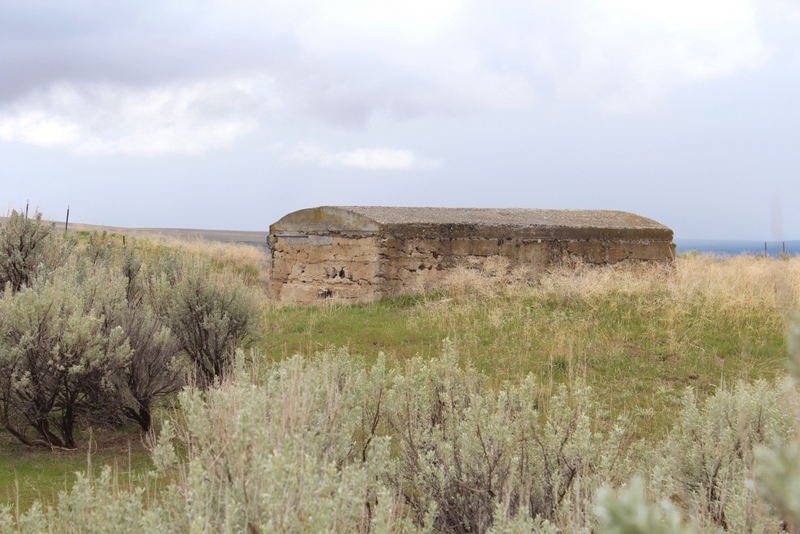 Not much evidence remains of the original indigenous people who made a living in these exact spots, though we drove home through lands owned by the Confederated Tribes of Warm Springs, and Picture Gorge is named for the pictographs left by some of the original inhabitants. The Cant Ranch exhibits, though mainly concerned with the primarily Scottish immigrants who settled in the area in the 1800s, did allude some to the people they displaced. Both populations are impressive in their own way–the one for having created a way of life here for such a long and sustained time, and the other for managing to thrive even when dropped into the harshest environment many had ever experienced. I admit, though, that I felt a lot of frustration for the proliferation of fences along almost every road, warning off anyone of any descent from crossing over into “private property”. All these mesas and hills to be climbed and explored, and yet we were limited to the few trails in the Fossil Beds units. The human story, it would seem, is punctuated by barbed wire, even in its most open and rambling pages. What struck me most about our trip, though, was just how evident the geological story is. The Fossil Beds are unique in that erosion has bared the layers of millions of years, sedimentation and lava flows and ash falls and flooding. You can look at a high peak like Sheep Rock and read the strata like a prehistory book. When you realize the highest crags of mesas near Picture Gorge are where the valley floor was seven million years ago, and everything has eroded since, you can imagine how high the ground would have been above your head now, and wonder at the immense span of time that it took to build up those landforms in the first place. All those millions of years alluded to in books and documentaries are set into stone here. I and others have often referred to watersheds as the hearts of bioregions. This is true; however, the (literal) bedrock of the watershed is the geology. Everything else in a bioregion–where the rain goes once it falls and whether it collects anywhere, what the weather and climate patterns are like, what flora and fauna can live there, etc.–all these are determined in large part by the geology of the place. The landforms in and surrounding the bioregion are the canvas upon which everything else there is painted. So it is in the desert. Forty-four million years ago, the places we visited were a lush rain forest, and the fossils from that time reflect that. The uplifting of the Cascade mountains to the west created a rain shadow later that began the process of desertification, compounded by multiple and varied volcanic activities in the area over time. From rain forest, the land changed to deciduous hardwood forest, then grasslands, and finally to the sage-and-juniper-studded desert of today. Most of the time, the layers of ages are buried far beneath our feet, accessible only through the occasional cave or road cutaway, or the fieldwork of geologists (when funding permits). We don’t think about anything but the top layer, the part we think is the main player in our lives. But each stripe of soil and rock rests on another; it’s terra all the way down. Isn’t that the way it is with us, too? 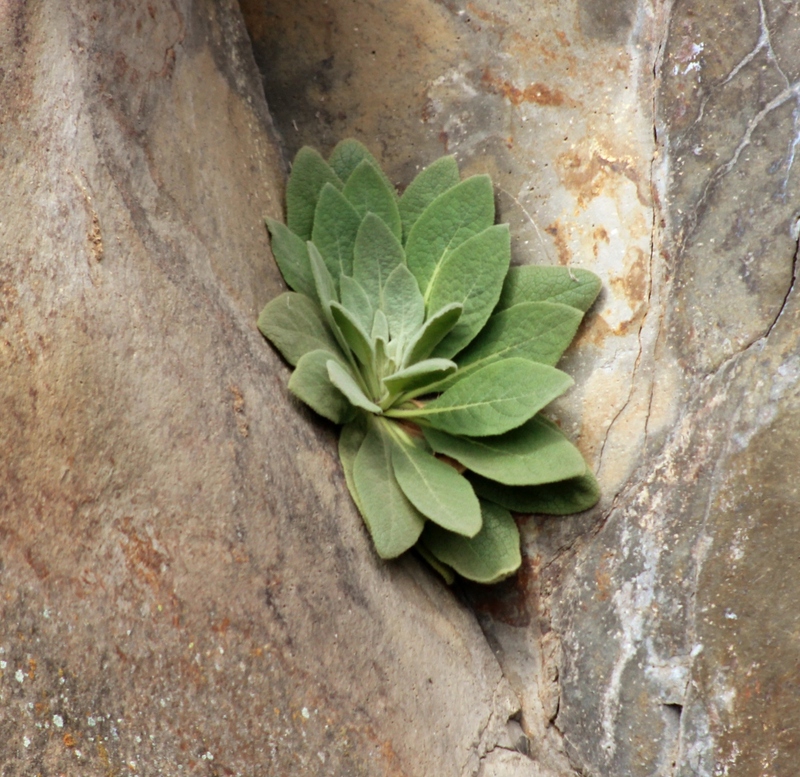 Common mullein growing in a crevice in Picture Gorge, OR. Lupa, 2013. I hope the desert with all its layers, visible and hidden, survives us. I have never seen so much land with so few roads; even in the Midwest rural areas where I grew up the spaces between towns was netted by county roads all over. Here, there were thousands upon thousands of acres broken up mainly by the barbed wire, a few roads, and the occasional agricultural endeavor. I hope I never live to see the Fossil Beds surrounded by cookie-cutter houses and billboards advertising new subdivisions “for those wanting to escape the city!” Here there are more than just traces of wilderness, more than just a scant reminder of what the land looked like before humans exploded into seven billion. And yet even I fall prey to the shifting baseline problem–my baseline is of sagebrush scrublands cut with fences and two-lane highways, grazed by cattle and sheep, and encroached upon by cheatgrass and the invasive tumbleweed produced by prickly Russian thistle. Three hundred years ago, only the sagebrush was here; the rest were yet to come. What to me might seem like an impossible walk back in time would be, to others, not just preservation but restoration. I leave you with a few more pictures (as with all of the, you can click them to get bigger versions); in another century will these represent something long-lost? Perhaps if most of us can visit the desert and then kiss it good-bye again, rather than insisting on cohabitation, there will be the chance of continued hospitality without being ungracious guests. Abandoned root cellar, OR. Lupa, 2013. One of many, many outcroppings. Lupa, 2013. 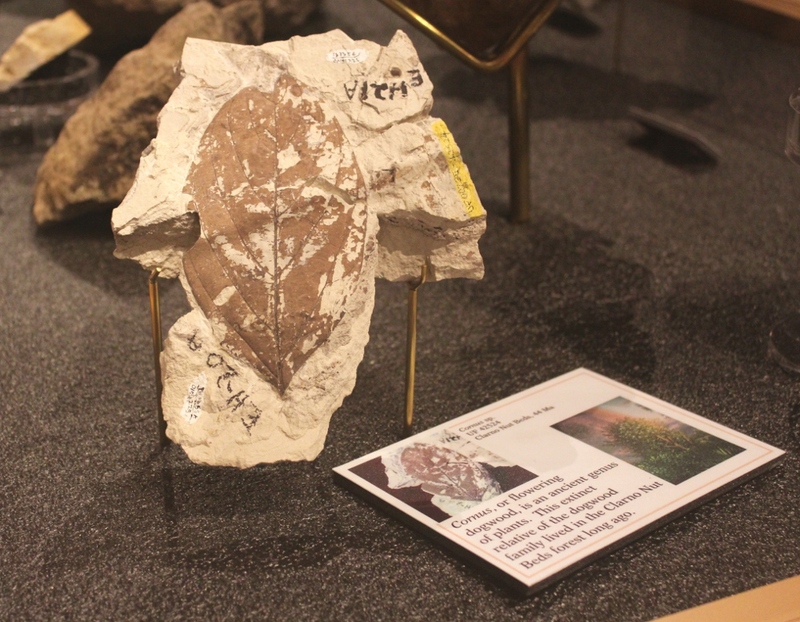 Fossil Leaf, Thomas Condon Paleontology Center, OR. Lupa, 2013. 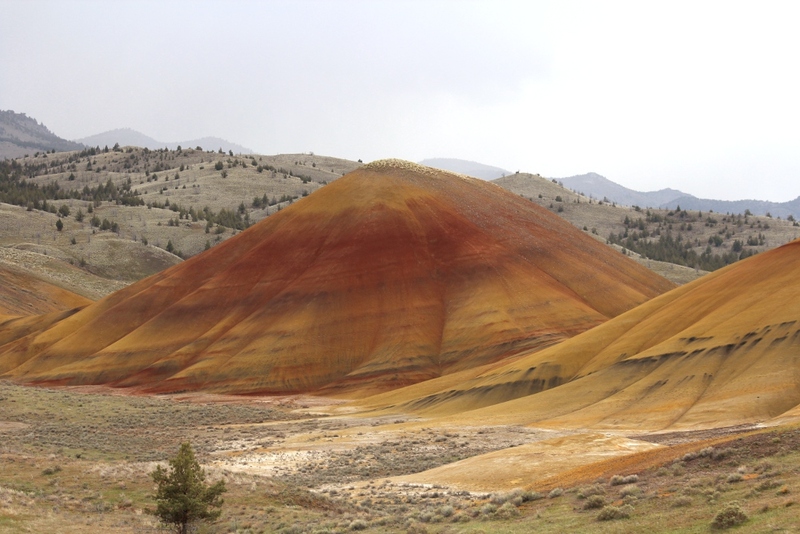 This is what the Painted Hills are made of. Lupa, 2013. And one of the hills. Lupa, 2013. The Say’s phoebe I managed to get a picture of despite its unwillingness to stay put for more than a few seconds at a time. Lupa, 2013. I’m back in my art studio again, which means it’s documentary time! While I do very much love being outdoors (as we established in my last post), and nothing compares to the experience of being out in the wilderness, I do enjoy books and documentaries on various natural and scientific topics. The documentaries are a nice thing to have on while I’m working on artwork; I sometimes revisit old favorites, swapped up with new finds on Netflix and YouTube. I love re-watching the “Walking With” series about various dinosaurs and other prehistoric critters, even in spite of the factual errors here and there. I also found a neat BBC series on the evolution of plants, and I spent a while being completely fascinated by the history of the kings of Britain (a bit of latter-day human hierarchical behavior in action). Most recently I watched The Secret of the Savannah, one of a four-part BBC series highlighting just a tiny bit of the intricate webbing of several complex ecosystems. In this episode the interconnection among the animals, plants, and even base chemical components of grasslands in the Americas, Africa, and Australia were explored, often with surprising results. For example, we know it’s critical to keep the white rhinoceros from going extinct. One of the many reasons is because it’s one of the very few animals that can live on nitrogen-poor “sour” grass. The rhino can process it enough that more nitrogen fixes and leads to “sweeter” grass, which allows other animals, such as antelope, to then live there and create an even more vibrant ecosystem. Similarly, maned wolves, ants, and a particular kind of fruit form a strong triangle of food and fertilizer, benefiting all three as well as others. And so on. We have made a great career of ignoring these existing relationships that have developed over millions of years. We as a species have done more than our fair share of meddling with existing ecosystems. Few places have not lost native species or had invasives introduced by our hand. And until recently we hadn’t even thought of the effects of those changes. So selfishly we decided we needed the deer and elk more than the wolves and cougars did, and we even determined that the landscape wasn’t good enough without some Chinese pheasants for us to hunt. And just for good measure, we turned much of the land to agriculture (and some of it to Dust Bowl in the 1930s). So it was that much of the Great Plains, the United States’ great grasslands, changed to our whim. And now natives like the prairie chicken hang on by a thread, and others move to take their place. Certainly the ring-necked pheasant from China isn’t nearly so competitive an invasive as some, and doesn’t have as much to do with the prairie chicken’s lowering numbers as loss of habitat to agriculture does. But if the chickens were all gone, would the pheasant be able to step into its niche? Likely not. While the documentary didn’t detail this particular bird, it did make it clear that we don’t know nearly all the ways in which the species of an ecosystem rely on each other. Given that the chicken evolved here and the pheasant didn’t, there would almost certainly be some “invisible cords” missing if the latter were to go away forever. The “thousand invisible cords” in the title are a reference to John Muir’s original quote, “When we try to pick out anything by itself we find that it is bound fast by a thousand invisible cords that cannot be broken, to everything in the universe” (Muir 1988, p. 110) These cords can be broken, but only by the eradication of a species at one end of it. The cords also cannot be transferred; new ones must be forged, and those forged hastily are rarely as strong or as neatly woven into the ecological pattern. The relationships that the prairie chicken has to the grasses and insects are unique, and the pheasant cannot expect to create the same. The very differences in physical biology of the two birds prevent it, never mind their individual behavior and how that affects their place in the ecosystem. This is why I am heartened to see a shift to a more systemic approach to nature, instead of just focusing on a single or few charismatic animal species. Our tendency to tunnel-vision has contributed greatly to our ignoring the effects of our decisions, and if we can cultivate a wider way of approaching the world, perhaps we can make wiser, more informed decisions as we move forward. At the very least, if we’re going to be successful in reviving the ecosystems we’ve damaged, we need to have more of an understanding of the intricate ways in which they work. It’s not enough to slap some plants and animals and fungi together and call it good; we need the hows and whys of those beings all together. This is also why I cultivate the totemic ecosystem. Nature spirituality is a popular way for those feeling disconnected from the natural world to try to access it again. The abstract symbolism and archetypes of totems create imagery that may be easier to grasp than the sometimes very alien world of the wilderness, especially for those who have forgotten their own wild heritage. Plus many of us have come into adulthood without those natural connections intact. The practice of ritual can not only get us in touch with the wild again, but also re-teach us the crucial element of play. Play is how young animals explore their world, and it’s one way we can engage in similar exploration. But just as young animals don’t only make a study of one or two species in their ecosystem, so we need to expand beyond our individual totems and favorite animals. The spiritual world is not only made of wolves and eagles and bears, but also the totems of mychorrizal fungi and the politics of field mice and the spirits of storm clouds. If your totem is Cougar, then it is good to know as much about cougars as possible. But it’s also important to know who the cougar’s neighbors are, what it eats and why, and what happens when the cougar is taken away, even to the effects on the very soil itself. And the spirits and totems of these can be known as well. So it may not so much be that Cougar is your totem, as it is that Cougar’s Home is your totemic ecosystem. Clearly there is much more to the study and practice of totemism than just the animals. So. Think about your local ecosystem and all the intricate connections. Let the concepts percolate in your head, and then let them slowly begin to ooze up into your consciousness. See if your worldview then expands, pick up your stick and drum, and go explore. Muir, John (1988). My First Summer in the Sierra. Boston: Houghton Mifflin. I think I may be too linear for my own good. See, I had this grand plan of expanding outward in my writing, from animal totems, to plant and fungi totems, to geological totems, and so forth. I’ve been working with all of these to varying degrees in my ongoing work with bioregional totemism in a multilayered form, but I’d planned to be more in-a-row with the writing. As is so often the case with spiritual beings, somebody didn’t like that–specifically, the geological totems. So to make them happy, allow me to introduce them. First, I need to explain what I mean by geological totems. A geological totem is the presiding spirit of a given specific geological phenomenon. It is not defined solely by a specific type of stone, or a single landslide, but instead is more a conglomerate of forces coming together to create a particular phenomenon, like a canyon or a mountain or watershed. 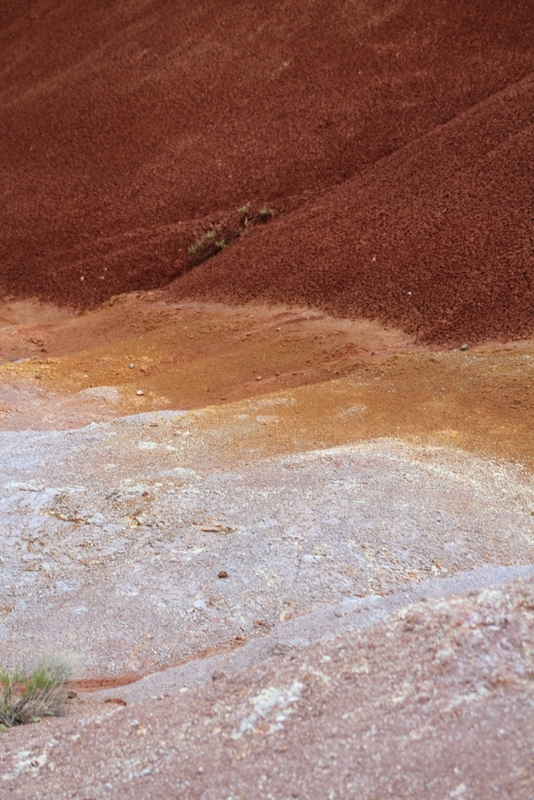 And they overlap quite a bit, too, to the point that, like sediments turning into sandstone, their identities can merge into one even as the individual grains are still perceptible. Columbia River Gorge near Hood River, OR. Photo by Lupa, 2012. 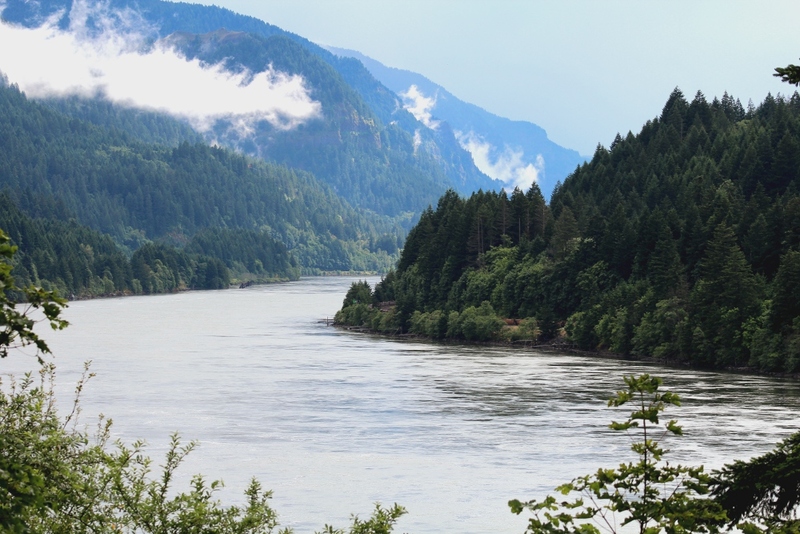 The Columbia River Gorge is a very good example. The oldest rocks are from volcanic activity 40-20 million years ago. The high walls of the Gorge are made of dozens of layers of basalt, which formed 15-10 millions of years ago from incredibly large lava flows. Volcanoes around what is now the border of Idaho and Oregon produced so much lava that eventually the basalt was over a mile thick in places. Even more volcanoes erupted to create the Cascade mountain range 2-1 million years ago; the Columbia River flows through these mountains. And as if all that volcanic activity weren’t enough, 16,000 – 14,000 years ago all that volcanic matter was carved and sliced and ground into the Gorge we know today–by massive flood of water. The enormous Glacial Lake Missoula, created by meltwater from glaciers at the time, would periodically flood, sending walls of water up to several hundred feet high down the course of the Columbia, deepening and widening its bed. 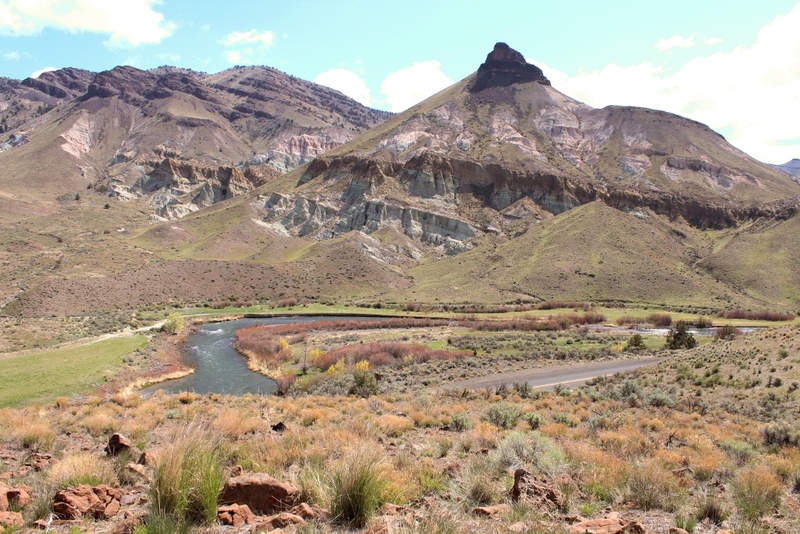 Each outpouring, whether from volcano or lake, added its spirit to the Gorge; the oldest volcanic matter from before the basalt floods, and the rocks carried from Glacial Lake Missoula, are equally a part of the totemic Gorge. When did the Gorge proper begin, though? Was it the same totem before the Missoula floods, when the land was more gently rolling and the river traveled a narrower path? Not only are geological totems layered in terms of composition but, it would appear, in time as well. And each section of the Gorge has its own smaller place spirit as well. Some of them have territories that are very starkly defined; you can tell when you get from one part to another as the energy of the place changes–I’ve noticed, for example, a distinct shift as soon as the Gorge comes out of the Cascades on the eastern side. Other times the spirits flow together more gradually. The spirit of the Gorge near Multnomah Falls is different from that at the Bonneville Dam, but the shift between them happens over several miles. All of them come together, though to be the Gorge, and the Columbia River itself also maintains its unique identity even as it, too, becomes a part of the overall totem of the Gorge. This brings up the idea that totemic identities are, to an extent, arbitrary. We can’t pinpoint when one species of animal evolves into another. At some point we say that Group A of a species has differentiated itself enough from Group B to be a new species, but you can’t look at a parent and young and say “this one is of Group A and this one of Group B”. What makes some geological totems unique is that they can sometimes have very marked beginnings and/or endings. For our purposes, we can delineate a geological totem in part based on its current form and how it got to be that way. Some, like the Gorge, have a relatively quick birth (2,000 years of flooding is next to nothing in geological time);. The totem of that area was a very different being when the land was more sloping and gradual with a smaller river running through a narrow v-shaped canyon; it died (or, perhaps, was reborn?) when the floods carved out the Gorge itself and changed the landscape in other drastic ways. Others shift incredibly gradually, like the slow movement of tectonic plates and the rearranging of continents. There are places in the Midwest where I grew up that, other than some farming and mining by humans, have remained the same for millions of years. The totems of these places are ancient, with a long continuum of memory. Perhaps trauma and sudden change mark the beginning and end of the “life” of a geological totem. Whether the totem itself dies and is replaced by another, or simply changes as drastically as its physical features, is unclear. I am working primarily with meditations and journeys to various places, to include visiting the memories of totems past in a sort of spiritual time-travel. I have not yet witnessed a place before and after such a great change, and most of these changes (mountain uplift, erosion, etc.) would take longer than my lifetime to complete. The best bet would be to visit a volcano that exploded itself into oblivion and then was replaced by a new volcano, but that would require a lot of luck and great timing (and also not being around when the explosion itself occurred!) I’d be interested to hear from anyone who has experienced such a thing. To a lesser degree, humans do change a place. We have learned to destroy mountains and fill in rivers and wetlands, but these feel more like slow suffocations than rebirths. It’s like the workings of our hands and machines just aren’t enough to equal the cataclysmic rebirths of entire places. Again, visiting a place before and after a nuclear bombing might show a marked change, but if all goes well we’ll never have that happen again. Geological totems also are defined more by what has formed them than by supposed inherent qualities of their materials. Those who work with crystals and stones on spiritual and magical bases may attribute certain qualities to a given mineral–healing for amethyst, protection for tiger’s eye, etc. But stones from a particular place are to the geological totem of that place what individual animals are to the totem of that species. Animals are mostly defined, roughly speaking, by a common set of physical and behavioral traits common across the entire species (even if it’s spread across several different locations. But stones and their totems work differently. In my experience, stones, crystals, and the like are not so much defined just by being “amethyst” or “granite”, as they are by the specific set of phenomena that created them, and the overarching totems of those phenomena and their aftermath. 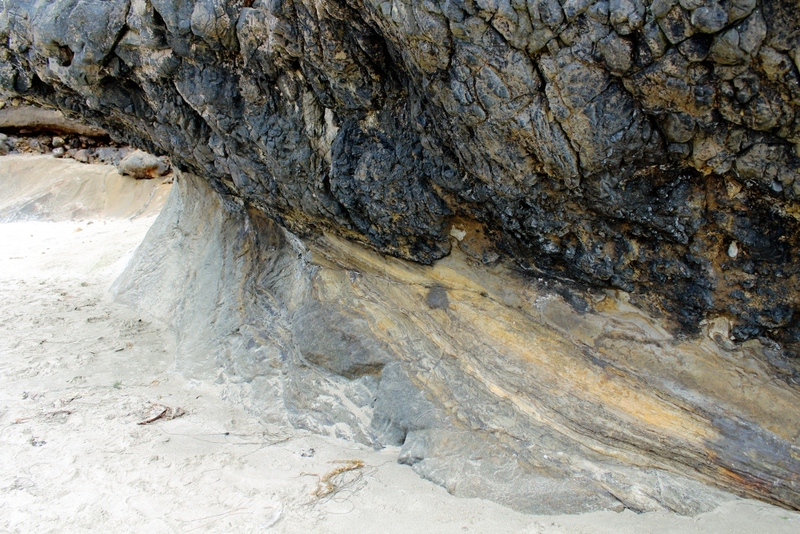 Coastal basalt formation near Waldport, OR. Photo by Lupa, 2012. While basalt created in Hungary can have some similar qualities to that created in Oregon, and their origins in terrestrial basalt floods may give them a kinship different from basalt from other sources, each carries the spirit of the flood that created them, as well as the places they settled. I have on my place altar two pieces of basalt, one from Devil’s Rest just west of Multnomah Falls in the Gorge, and one from the Oregon coast near Waldport, OR. 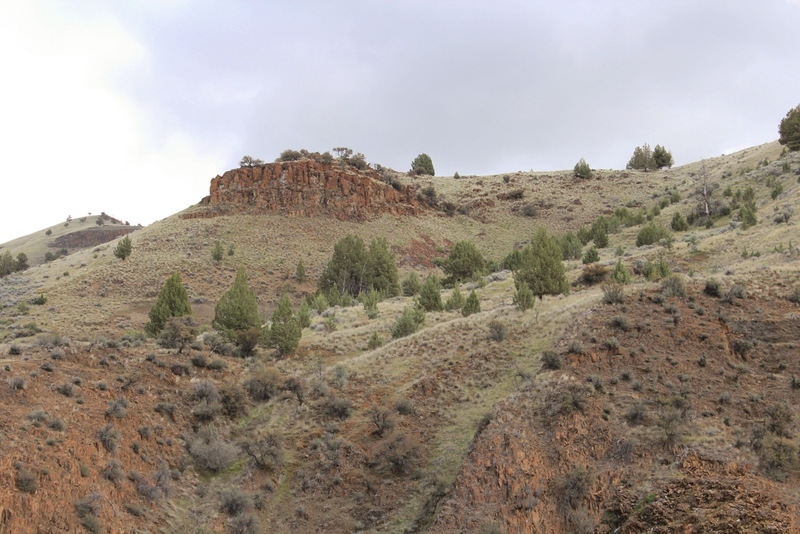 These are from the same sets of basalt floods that created much of Oregon’s bedrock, but they likely came from two different flows, and were sited over 100 miles apart. In the millions of years since they cooled from their lava state, they’ve become part of very different landscapes with their own individual stories, and have seen quite a bit. There’s a bit of resonance because they had similar sources and chemical compositions, but they are very different stones, and I would not say they had identical qualities. So I don’t work with the totem of Basalt, though there’s nothing wrong with that. Instead, I work with the totem of the Gorge, the lava flows and waters that created it, and the ongoing human influences of dams and roads and such. Every piece of natural history that comes out of a place carries the spirit of the place, but it is the geological totems that remember the most. The plants and animals may come and go as extinctions and evolutions occur, as climate changes and drives some away while attracting others. They are the bedrock on which a bioregion is formed, and the soil that feeds its fauna and flora; they are the courses of waterways as well (I’ll give water totems their own post soon, too). It’s a shame that stones and others are usually seen as only spell components and materials for tools, for the totems of the phenomena that created them are some of the oldest, most powerful, and most well-storied. They may not be truly permanent; every mountain erodes, streams dry up, and lava buries the land below it. But if you really want to get to know the bioregion you’re a part of, to include on a spiritual level, start talking to the geological totems, of floods and flows, scrapes and sediments.